I watched Kung Fu Panda a long time ago and remember really enjoying it. I don’t expect a lot from American animated movies that aren’t made by Disney, Pixar, or Laika, but I think this movie is definitely up there with the best. 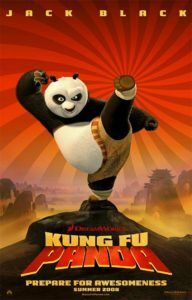 Po (Jack Black) is a panda that dreams of being an amazing kung-fu warrior just like his heroes the Furious Five who protect the valley he lives in. When the masters of the Jade Temple announce that the legendary Dragon Warrior is about to be proclaimed, Po eagerly rushes to see which of the Furious Five it will be. To everyone’s surprise, Master Oogway chooses Po, who is completely unprepared for his daydreams to actually come true. He has to master kung fu in a very short time, because Tai Lung, once the Jade Temple’s best student, has escaped his prison and is heading to the valley for revenge, and only the Dragon Warrior can stop him. On the surface, Kung Fu Panda is a typical story – an unlikely hero pushes past his circumstances and saves the day. However, it’s got great worldbuilding (it takes its setting of ancient China seriously), the characters are heartwarming and fit the setting (Po’s relationship with his dad is great, the Furious Five take Po’s ascension especially well), and the multiple characters actually grow over the movie. Plus the cast is great! Jack Black is fantastic as Po, but we also have Dustin Hoffman, Angelina Jolie, Jackie Chan, and a bunch of other great actors. Po and the Furious Five are back, this time heading out of their valley to defend China from Lord Shen, a bitter peacock prince that wants to obsolete kung fu and conquer the whole country. Po has accepted his role as the Dragon Warrior, but he keeps being distracted by Lord Shen’s insignia bringing up painful childhood memories. Unlike a lot of sequels, most of the things that are good about the first movie stay that way – Po has a good character growth arc, the rest of the characters continue to be heartwarming, and we see the worldbuilding expand into greater China. The cast continues to be terrific as well with some great new additions – Gary Oldman as Lord Shen, Michelle Yeoh as the Soothsayer, and Dennis Haysbert and Jean-Claude Van Damme as other kung fu masters. I didn’t love this one as much as the first two, but it was still very good. Po is reunited with his birth father, Li Shan (played excellently by Bryan Cranston), but he can’t enjoy it for long since Kai (J.K. Simmons), an ancient foe of Master Oogway, has returned from the spirit realm and intends to absorb the power of every kung fu master alive. Po’s arc this time focuses on learning to be a teacher in addition to being a warrior, and the mythology of the world is expanded further with the addition of the spirit realm. I was worried that the addition of Po’s real father would take away from his relationship with his adopted father (which has been one of the cornerstones of the movies), but the movie handles it very well. A black comedy about Patrick Bateman (Christian Bale), an investment banker in New York with a uncontrollable urge to violently murder people. I can’t imagine anyone other than Christian Bale in the part – he portrays Bateman perfectly, going from vacuous charm to quivering rage in minutes. Don’t expect this movie to tell a tidy story – it’s unclear if Bateman is even who he says he is or if the events of this movie are happening outside his own head, and the ending is a little abrupt. This movie is also not for the squeamish, describing the violence as gratuitous is an understatement, and if you took it seriously, it would be horrifying (Wikipedia calls it a horror movie, in fact). I don’t think I’m doing a very good job reviewing the movie, and I’m not sure how to do it any better, but it’s definitely worth watching. Based on the true story of Joey Coyle, an unemployed Philadelphia dockworker that found $1.2 million in cash in the street (it had fallen out of an armored truck) and decided to keep it. The police get closer and closer to finding him, and he becomes increasingly desperate to keep the money somehow. I didn’t expect a lot from this movie but it turned out to be pretty decent. John Cusack does almost too good of a job playing someone that’s permanently on edge, it was uncomfortable to watch him sometimes. This is one of those movies that you know is good but never want to watch again, primarily because it portrays Coyle’s predicament so well that it just makes you anxious the whole time. I’d heard terrible things about Cars 2 but I thought they had to be wrong. People didn’t like the original Cars as much as Pixar’s other movies, but I loved it, so I figured the same would apply to the sequel. Unfortunately, I was wrong – this is definitely one of Pixar’s rare missteps. The protagonist is the dumb-but-affable Mater (the tow truck from Radiator Springs), who gets mixed up with some British spies and ends up having to save the world (and his friends) from an evil conspiracy, all without knowing what he’s doing (literally). As a standalone movie, it wasn’t bad – the spy stuff is done fairly well, but Mater is a really annoying character, and there’s none of the heart from Cars. Even Lightning is reduced to a few stock catchphrases. I really hope Cars 3 will be better. The fourth (and thankfully last) movie of the 80s-90s Batman film franchise, Batman and Robin probably shouldn’t have even been made. Batman Forever director Joel Schumacher returns, but we have yet another actor playing Batman – George Clooney – who is utterly wasted in the role and doesn’t seem to have any personality. This movie also features Batgirl (Alicia Silverstone), who I found supremely annoying and seemed shoehorned into the movie. The villains are Poison Ivy (Uma Thurman) and Mr. Freeze (Arnold Schwarzenegger), whose scenery chewing may be the only saving grace of the movie (especially Mr. Freeze’s puns) – but really, it’s just bad all the way through. No wonder everyone loved Batman Begins so much after this!